'To a Butterfly' is a lyric poem that William Wordsworth wrote in 1802. In the poem, he recalls how he and his sister Dorothy would chase butterflies as children when they were living together in Cockermouth, before they were separated following their mother's death in 1778 when he was barely eight years old. The 'Emmeline' of the poem is Wordsworth's sister Dorothy. 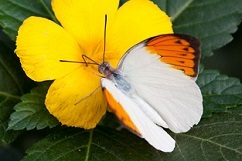 William Wordsworth wrote two versions of the poem “To A Butterfly,” one in March, the other in April. Both versions of the poem are about the memory that the sight of a butterfly brings back, not so much a memory but a feeling the poet gets upon seeing this butterfly.